Riccarton is a mix of people from many countries. From the Maori who originally settled the area, to early English settlers, to today's increasing migrant population, the suburb has become possibly the most diverse in Christchurch. This diversity makes it a vibrant place, but also makes it harder for residents and visitors to know the services available and what is happening around the place. The Riccarton Community Hub is a service of the Oak Development Trust to provide that information, to help people find out and keep in touch. 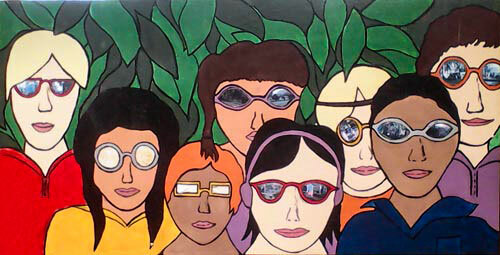 * Thanks to Kirkwood Intermediate School for permission to use their mural as our logo. The 2013 Census recorded the population of the Riccarton Ward* of Christchurch City as 23,199, which was 6.8% of the total Christchurch population. The Riccarton Ward also takes in Ilam and parts of Sockburn. In the whole ward, the largest age group were people aged 15-39 years, at almost 54%. People from Asian countries comprise the greatest percentage of ethnicities after Europeans. In 2013, 30,717 people in Christchurch city identified with the Asian ethnic group, making it the second largest ethnic group in Christchurch City after Europeans. The Asian ethnic group – which includes people from a diverse range of countries such as China, Japan, Korea, India, Vietnam, SriLanka, Phillipines, Malaysia and Cambodia – comprised nine per cent of the City's population. By contrast, around 23% of the Riccarton population are from Asian ethnic groups, with Europeans comprising just under 70%. Riccarton has a young population compared with the rest of Christchurch. 54% are aged 15-39, whereas in greater Christchurch that age group comprises only 34% of the population. Just under 13% in Riccarton Ward are older than 65 years, compared with 15% in that age range over the whole of Christchurch. The area has the lowest rate of employment in Christchurch City. Only 38% are employed full time, compared with 49% in the city as a whole. However, this reflects the higher number of students compared with the rest of Christchurch. Riccarton people are active, and involved in their community, as seen in the wide range of services and activities throughout the area. Many are working hard to build bridges between the longer-term residents and the floating population. * Note: The Riccarton Ward also takes in parts of Ilam and Sockburn. The Canterbury Fiji Social Services Trust has been providing affordable community service programmes for Pacific Island and other ethnic groups from low-income families in not only the Upper Riccarton and Hei Hei areas, but also the within the wider community. They operate with the aim of enabling socialisation into the community, cultural awareness, life skills, self-motivation, confidence building/self esteem in a happy and safe environment. Providing support and advocacy for individuals in dealing with everyday life events and challenges is an area that CFSST continue to specialise in. CDN Trust is located in Elizabeth Street in Riccarton along with their parent organisation, Riccarton Community Church. CDN Trust mainly works with youth and children in the Riccarton and Hornby areas, providing 24/7 and children's workers into local schools and programmes aimed at this age demographic. The Trust along with the Church, Sport Canterbury and the New Zealand Institute of Sport also run programmes with young people encouraging involvement in active recreation activities. Sports In The Park is one such initiative where in the first and last term of each year, after-school sporting activities are run in Harrington Park. The Church also runs a number of successful community activities based around families, including an annual street party, which sees part of Elizabeth Street closed down for a family-based event. The Sockburn Service Centre was constructed in 1958 and was the home of the Paparua County Council. 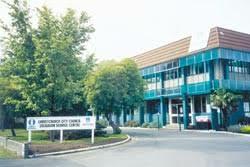 Prior to 2011 it housed a Service Centre, staff accommodation, the Board room for the Riccarton/Wigram Community Board and New Zealand Post postboxes. A Civil Defence Training Facility was housed in a separate building alongside the main building. Since 2011, the building has been assessed as Earthquake Prone and recommended to remain unoccupied. Options for the repair of the building were considered along with building on the site and replacing the facility with a larger service centre and library facility in the south west. The latter option has been selected. The Sockburn Recreation Centre has been leased to Squash Canterbury and Wrestling Canterbury since the Sockburn Pool was decommissioned in 2006. The former pool site now forms Sockburn Park and is flanked by the Weaver Place social housing complex and the Springs Early Learning Centre (housed in a Council-owned building). La Vida Youth Trust is a charitable organisation based in Upper Riccarton that provides 24-7 Youth Workers into two local schools and runs an after-school programme and a breakfast club. They also lead other community initiatives such as a successful Community Day and undertaking community development, particularly with youth. The Trust is based with the Life Church who have the impressive La Vida Centre in Hansens Lane. This is a multi-purpose conference centre with a 700 seat auditorium, café space and commercial kitchen. Located partly in the Riccarton ward, Mona Vale is a public park of four hectares. The homestead and gatehouse are both listed as heritage buildings. The rose garden, fernery and pavilion, along with the park and Avon River setting, make this a popular venue for visitors. Some of the buildings, including the Homestead have recently been re-opened after repair through the Facilities Rebuild programme. Oak Development Trust started in 2012 to provide community outreach to the Riccarton community. The Trust now focuses on supporting families, with a special emphasis on migrant families. They employ a Korean family worker and work closely with PEETO who are based in the same building at Riccarton Baptist Church in Rattray Street. They also run a community café on the first and third Friday of each month, weekly Mainly Music sessions, six-weekly nail clinics, two-monthly gatherings for older adults, provide support services for the monthly newsletter and the Riccarton West Community Garden. A recently employed Community Development worker provides linkages with Housing New Zealand properties in the area, including making connections welcome packs to new residents. The former Riccarton Community Centre sustained extensive damage in the 2010 and 2011 earthquakes. Although part of the centre, including that occupied by the Riccarton Service Centre, was able to be opened, the majority of the centre which was used by the community received a DEE assessment of less than 5%. It was established that the best option was to build a new centre rather than repair the existing centre. This is to be funded by the sale of part of the existing centre footprint, topped up with $1m. The footprint (which contains the existing centre) was sold in 2016 to Westfields. Following a long process, the Community Board signed off on a Design Concept in December 2016. Westfields have agreed to lease back space for the Service Centre in the interim until the new Community Centre is built. Riccarton House was the homestead commissioned by John Deans in the mid-1850s. The Deans brothers were the second group of Europeans to settle in Christchurch. A replica of their original cob cottage is on the grounds. 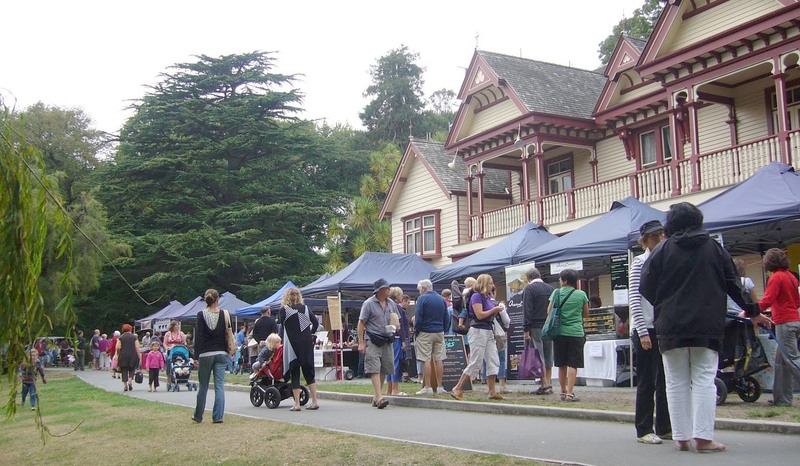 Riccarton House is now a function centre and venue of a popular Christchurch Farmer's Market on Saturday mornings. Adjacent to Riccarton House is Riccarton Bush, which has also been known as Deans Bush. A predator-proof perimeter fence protects the last remnant of a forest type that once dominated the Canterbury Plains. The House and Bush are administered by the Riccarton House Trust, which was established by an Act of Parliament in 1914. The Trustees are appointed by the Royal Society, the Deans family and the Christchurch City Council. Although the Riccarton Neighbourhood Policing Team left the area in October 2016, they have left an impact in the area that it is hoped will last for some time. Through their collaborative work with other organisations and local residents, the community have become empowered to provide and be involved in a number of initiatives that develop and nurture social connectivity. A key part of this was connecting with students in the area and then connecting students, residents and local organisations together. There has been a reduction in crime in the area, including a noticeable drop in graffiti. Local residents are now much more pro-active in immediately reporting graffiti and getting it removed. The Community Garden came into being in October 2013 when a group of students from the Student Volunteer Army, members of the Riccarton West Neighbourhood Policing team and residents of the local community came to together to dig the bare land and prepare the site for planting. The land has been loaned to the community by Housing New Zealand on a year-to-year basis. Through the hard work of many volunteers, sponsorship from businesses and funding from the Rata Foundation and the Community Board CCC, the garden has evolved to where it is today. Throughout the year, garden volunteers deliver excess produce to those 'in need' in the Riccarton area, often elderly. In December 2016, they decided to hold a Christmas lunch for those same people which over 60 local community members attended, enjoying produce from the garden and donated goods. The Riccarton intersection of Tara Street and Shand Crescent is the location of a unique street art project. 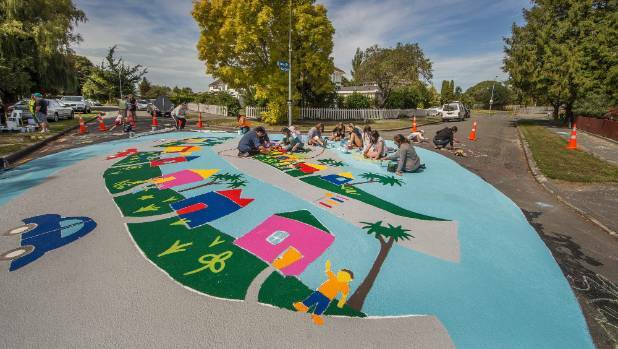 The community project led by the Riccarton Baptist Church, the Student Volunteer Army, the SafeGrowth group and the local Neighbourhood Support group was devised to bring people together in creativity. Preschools, primary schools and the wider community were encouraged to offer ideas at workshops and eventually the design was chosen from around 90 submissions. People from the community spent a weekend in March 2016 painting the intersection. The University of Canterbury is New Zealand's second oldest university. It was founded in 1873 as Canterbury College, the first constituent college of the University of New Zealand. Its original campus was in the central city, but in 1961 when it became an independent university it also began moving out of its original neo-gothic buildings, which were re-purposed as the Christchurch Arts Centre. The university now operates its main campus in Ilam sitting on 87ha of land. In 2016, UC had a total of 10,838 students. 81% of these were undergraduates, and 2,014 international students. A total of 698 academic faculty staff are employed at the University. The number of students enrolled at the University of Canterbury has fallen from 18,783. 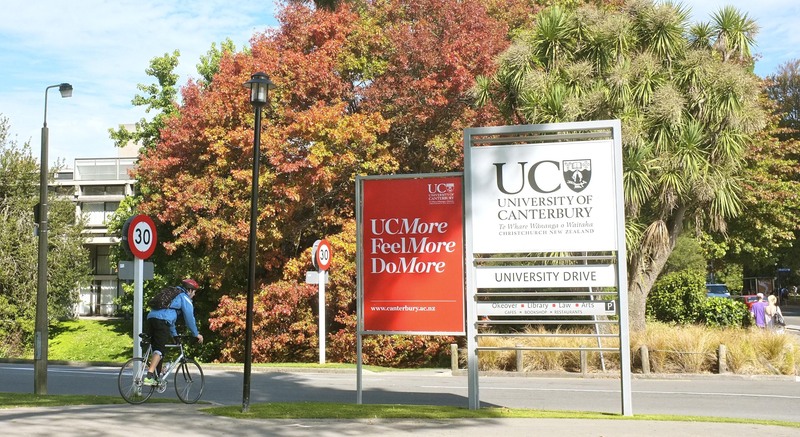 The University of Canterbury was the first NZ university to receive 5 Stars rating in 2011 by the international ranking agency QS and has maintained its 5 Stars status since then. The University has five subjects ranked in the world's top 100 – Civil & Structural Engineering, Accounting & Finance, Education, Geography and Law. The University released a master plan to guide campus development for the next 30 years, with the first stage outlining key projects and initiatives through to the University's 150 year jubilee in 2023. The University provides nine accommodation facilities for approximately 2200 students. The relationship between students and the more permanent residents in communities has often not been harmonious, particularly owing to a drinking and partying culture. However, in the Riccarton West area the presence of the Neighbourhood Policing team and the work of both the Student Army and the University of Canterbury's Community Engagement programme has brought about a marked improvement in both relationships and student behaviour. The introduction of a Good One Party register has provided students with an appreciation of the affects that parties have on local residents. Students becoming involved in community initiatives such as working bees and clean-ups have led residents to develop positive and ongoing relationships with the students. For three years, local community groups have run 'welcome to the community' events that connect local residents with students. The Wharenui Recreation Centre and Pool is located at the corner of Elizabeth and Matipo Streets. Formerly called the Coronation Baths, the Recreation Centre was built by the Riccarton Borough Council in 1989 and taken over by the Christchurch City Council upon amalgamation. The operation of both the pool and recreation centre was tendered out by the Council in 1994 to the Wharenui Swim Club. Although both facilities received damage in the 2011 earthquake, the pool was able to largely remain open. The recreation centre, however suffered damage which rendered it unusable. 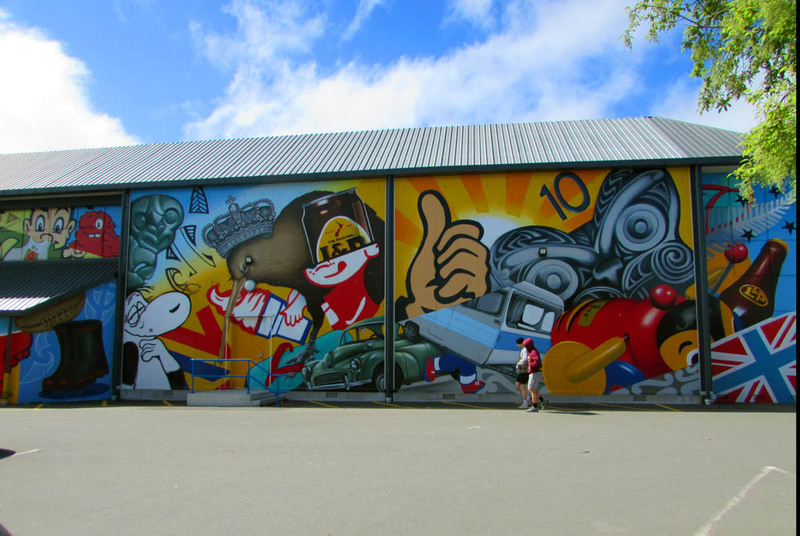 Both facilities have now been repaired as part of the facilities rebuild programme with an impressive kiwiana mural by graffiti artist Decypher featuring on the western wall.